Harry Grant was one of the most understated drivers of the early days. A two-time winner of the Vanderbilt Cup (1909 & 1910), he drove the same car both times: his black ALCO (American Locomotive Company). This article talks about the team's effort to tune the car for the first Indianapolis 500 by letting her out on the Long Island Motor Parkway. 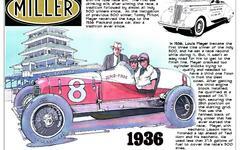 The car, built in 1909, was showing its age by the 1911 500-mile classic at the Indianapolis Motor Speedway. It finished 33rd in a field of 40 cars. Grant, by all accounts a jovial man, would meet a tragic end in 1915 at the new Sheepshead Bay (New York) board track. His Maxwell racer burst into flames. Grant was burnt severely and died of infection several days later. For more on Grant, check out the world's leading resource of Vanderbilt Cup Race information. The attached article was published in the May 21, 1911 Indianapolis Star.